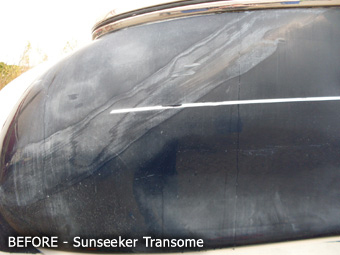 This service is a combination of thorough cleaning, use of the pressure washer on non slip surfaces (not teak), cleaning of teak to remove the grey and green, use of teak brightener to restore the original colour and shampoo and wash off to remove bird fouling on the hull, cleaning all the external lockers, windows and stainless. This service is very popular after the winter and when a vessel has been left for a long period of time, this process can be carried out in or out of the water. Ipswich Marine offers both summer & winter contracts (6 months). WINTER consisting of a monthly shampoo wash off and removing general dirt and grime. SUMMER consisting of a monthly shampoo & wash off cleaning of windows and stainless and periodic teak cleaning. This process is to remove top surface once it has been left porous by the sun’s uv rays, it can no longer sustain a normal wax polish. 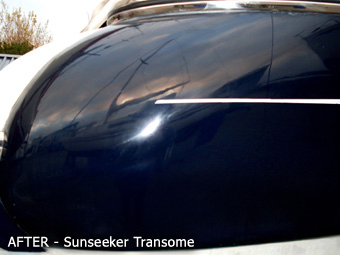 Once complete, the surface is waxed and polished to leave both shiny and sealed, this process can only be done whilst your boat is out of the water. Please contact us for quotation are subject to sight of hull conditions and any specific paint requirements. Burnham Yacht Harbour, Tollesbury Marina, Fambridge Yacht Haven, Fambridge Yacht Station, Gunfleet Marina, Suffolk Yacht Harbour, Neptune Marina, Tidemill Yacht Harbour to name but a few.